Part of the “New Breed,” second baseman Ken Boswell played a key role during the Amazin’ Mets’ run to the National League championship. And though platooning limited him to just one start in the 1969 World Series, he batted .333, the same robust average as he enjoyed in the NLCS, and celebrated with gusto as a 23-year-old world champion. Rules prohibited players that started school from signing a professional contract until their class had graduated. Boswell found a way around the rule--he flunked out of college. After confirming that he was indeed eligible, the Mets selected him in the fourth round of the June 1965 amateur draft, which included fellow 1969 Mets Les Rohr (drafted in the first round), Jim McAndrew (11th round), and Nolan Ryan (12th round). Boswell was one of five members of the ’69 Mets signed by legendary scout Red Murff, along with Ryan, Jerry Grote, Jerry Koosman, and Jesse Hudson. (Murff was also the one who figured out that the flunking-out loophole enabled him to be taken in the first-ever amateur draft.) Boswell made a splash in his debut with Auburn in the New York-Penn League, the club’s Class A affiliate, hitting safely in his first 19 games, and winning Rookie of the Year honors. Boswell hit .285 for Auburn, with 20 doubles and seven homers, but he made 14 errors in 72 games at second base. Boswell continued hitting at his next stop, Williamsport in the Double-A Eastern League, batting .299 (second on the team) in 63 games in 1966. Boswell struggled with the glove, however, committing 19 errors in 60 games, carving out a reputation as a “good-hit, no-field” prospect. He was promoted to Triple-A Jacksonville in midseason, playing second base and third base for the Suns. 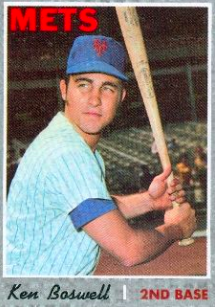 Boswell was called up to the majors at the close of the 1967 season, and made his Mets debut on the night of September 18, batting sixth and playing third base behind former Jacksonville teammate Tom Seaver. After grounding into a double play against the Dodgers’ John Duffie (also making his major-league debut) in the first inning, Boswell settled in, notching his first RBI in the fourth inning with a sacrifice fly and then collecting his first hit, an RBI-double in the sixth inning off of Jim Brewer. He also started a 5-4-3 double play to end the top of the seventh inning and help Seaver win his 15th game of the year. However, a freak injury in early 1968 prevented Boswell from a healthy start to the year. He slipped and fell on icy steps at his Texas home just before the start of spring training, injuring his ribs. Al Weis—acquired at Hodges’s request, along with Tommie Agee—received the bulk of the playing time at second base in the spring, with former Yankee Phil Linz seeing plenty of action as well. But Boswell had recovered well enough from the injury to earn the starting position. Most of his playing time came in the first half of the season, though, as a broken finger suffered on June 24 sidelined him until late August. Boswell’s rookie season was a modest success. He hit .261, very respectable in the Year of the Pitcher, in 75 games, and was the runner-up for the 1968 Topps Major League All-Star Rookie Team behind Dave Nelson of the Indians. Boswell was named a Topps All-Star Rookie. He opted out of another season in the Florida Instructional League to take part in scheduled drills with his Army reserve unit. The Mets were also a modest success in 1968, registering the most wins (73) in club history and passing their expansion partner, the Houston Astros, to finish ninth in the National League. Heading into 1969, the New York Times predicted better days ahead:. As the Mets gathered in St. Petersburg for spring training, Boswell came to camp healthy and able to concentrate fully on the game. Unlike the prior two years, there were no offseason accidents or military obligations to interrupt preparations for the season, and Boswell was entrenched as the second baseman in his manager’s left-handed platoon squad. Boswell started at second base in the Mets historic home opener on April 8 against the expansion Montreal Expos: the first international game in major-league history. Batting third, he had two hits and an RBI, but he committed three errors, including a pair in the first inning that led to two unearned runs for Tom Seaver. The Mets lost their eighth consecutive opener, 11-10. He had another two hits the following day, including his first home run of the season off Mike Wegener, as the Mets won, 9-5. His hot start with the bat carried over for most of April, as Boswell hit .275 over the first 17 games of the 1969 season. Boswell’s glove continued to cause some anxious moments, though, such as the April 23 game at Shea Stadium against the Pirates. Boswell’s third-inning error on Jim Bunning’s ground ball forced Jerry Koosman to face Roberto Clemente and Bob Robertson with the bases loaded. The left-hander worked out of trouble to win his first game of the year, a 2-0 shutout. And in the first game of a doubleheader against the Cubs on April 27, Boswell committed a key error in the ninth inning on a Billy Williams grounder (his eighth error of the young season), allowing the Cubs to rally against Cal Koonce and overcome a 6-4 deficit to beat the Mets on Randy Hundley’s two-run homer, 8-6. May opened with the Mets in third place in the new National League East division, two games below .500. Boswell slumped in May, batting .233. But his bat kept appearing in the middle of key rallies and important wins. He had four consecutive multi-hit games early in the month, including five hits in a Sunday doubleheader sweep of the Cubs in Chicago on May 4. Two days later, Boswell followed that performance with a home run off Jim Maloney to help Don Cardwell win his first game of the season. He also tagged a leadoff triple in the seventh inning to break up a Phil Niekro no-hitter in New York on May 14, sparking the team to a 9-3 comeback victory. But he spent the first two weeks of June serving in the Army reserve, missing most of the club-record 11-game winning streak that started with a late-May win over San Diego. Boswell returned to the lineup in a series at Philadelphia on June 17. Now batting second, he drove in the winning runs with a two-out, two-run, ninth-inning single off of Turk Farrell on June 19 in a 6-5 victory. He also notched two hits against Bob Gibson the following day back at Shea Stadium in front of a league-best crowd of 54,083, including a second-inning triple that drove in Tommie Agee. Boswell hit .261 in June, and the Mets enjoyed their winningest month ever, going 19-9. August 1 found the Mets six games out of first place with Boswell on the bench. He returned to the lineup in a series in Houston in the middle of the month. On August 12, however, his error on the relay for a potential double play in the sixth inning contributed to a four-run rally as the Astros came from behind to beat the Mets. The following day, Boswell’s failure to cleanly handle a ground ball in the first inning extended an Astros rally that culminated in a three-run home run by Denis Menke. The Astros swept the Mets--it was the low point of the season for Boswell and the team. Jack Lang noted in The Sporting News on August 30 that Boswell had been “resting a bruised thumb, a weak batting average, and an iron glove for some two weeks.”11 Prior to the benching, Boswell had gone hitless in 20 at-bats. After two weeks spent on the bench, Boswell returned to the lineup for good on August 23, as the Mets embarked on a torrid finish to the season. He was moved to the fifth spot in the batting order, occasionally moving to cleanup, as the Mets rolled to a 31-10 record from that on to capture the Eastern Division title. Boswell was locked in at the plate. He hit .407 over his last 29 games, with 12 multi-hit efforts, including six in a row from September 9 through September 18. And Boswell continued to swing the bat well against some of the league’s top pitchers. He had three hits, including a double, against the Giants and Gaylord Perry in a 3-2 win on August 30. He had three more hits, including two off Dodgers ace Don Sutton, in a September 2 win, and two hits and two runs batted in off Ferguson Jenkins and the Cubs in a key win on September 9. Boswell had arguably the biggest hit in Mets history, up to that time, on September 10. His 12th-inning, two-out single scored the winning run in the first game of a doubleheader against the Expos--a win that put the Mets into first place for the first time in team history. The day after Pittsburgh’s Bob Moose no-hit the Mets, the club’s third straight loss, Boswell reached base five times in a September 21 doubleheader sweep of the Pirates. The Mets clinched a few days later. He closed the schedule with a pair of hits against the Cubs in the season-ending game at Chicago, putting him at .279—his best average ever over a full season. In fact, Boswell did perform better in pressure situations in 1969, hitting .327 with men on base. He also tied for the team lead in game-winning RBIs with 10. Boswell particularly enjoyed tormenting the Cubs, hitting .365 with nine RBIs, his top marks against any team. The Atlanta Braves, the Mets’ opponent in the inaugural National League Championship Series, were scheduled to start three right-handed pitchers in the series. Boswell and the rest of Gil Hodges’s left-handed platoon would start each of the games. It was a quick series. On the field one last time in ’69, Boswell started against Jim Palmer at Shea Stadium in Game Three, the first World Series game in New York since 1964 and the first ever-Series game at Shea Stadium. Batting fifth, he had a single and run scored in three at-bats, as the Mets shut out the Orioles in a game best remembered for Tommie Agee’s acrobatics in the outfield. The 1969 season was Boswell’s finest year. He set career highs in runs (48), triples (7), batting average (.279), and slugging percentage (.381), and tied his career high for stolen bases with seven. However, there was speculation in the offseason that the Mets would find a new position for him. Boswell had the worst fielding percentage of any regular second baseman in the major leagues. His 18 errors in just 96 games also proved to be the worst mark of his career. Second base and third base were considered prime needs in their offseason shopping list. The Sporting News surprised no one by stating: “Boswell can hit but must improve in the field.”18 But Boswell proved them wrong. Although limited at the end of the season by a groin injury, Boswell set the all-time Mets fielding percentage record (.996) and finished the season with only two errors. He also set a career high in RBIs with 44, although his other offensive numbers dipped, including a 25-point dip in his average to .254. Speculation in the offseason was that manager Gil Hodges would make Boswell the fulltime second baseman in 1971, playing against both right- and left-handed pitching. And he did play regularly, setting career highs in games played (116), hits (107), and doubles (20) before shoulder tendinitis, a recurring problem that season, finally sidelined him in early September. The shoulder problem was severe enough to keep him out for the remainder of the season. The pain was so intense that he “couldn’t even swing a bat.”21 Medical opinion was that rest and a complete layoff was all that was necessary to bring him back to health. However, in late December, with the pain still lingering, he was flown to New York for another examination. The 1972 season was struggle. With the season beginning with Hodges’s tragic death, and Yogi Berra replacing the beloved manager, Boswell struggled mightily. He was benched briefly in June while hitting .173, and he batted .029 in July (1-for-34). He finally cracked the .200 barrier in mid-September, and finished the season batting .211. He also suffered in the field, with the fewest assists of any second baseman starting at least half of his team’s games and the second-fewest double plays. There were some notable moments. Boswell set a career high in home runs (nine). And his error on Roberto Clemente’s first-inning ground ball on September 29 temporarily delayed Clemente’s quest for his 3000th--and sadly, his final--career hit. Boswell assumed a utility role, playing in the fewest games since his rookie year. He was the team’s top pinch hitter in 1973, with 12 hits in 51 at-bats, including the only two pinch-hit home runs the Mets had during the season. He also started a handful of games at third base, primarily when Millan was given a day off--Wayne Garrett would start at second because Berra considered him more adept at turning the double play. After the Mets reprised their stunning ’69 finish to grab the division title with just 82 wins, Boswell had one at-bat in the NLCS against the Reds, going hitless as the Mets clinched the National League pennant in five games. He had a far more historic World Series. Boswell tied a Series record with three pinch-hits (all singles), plus a run scored, in three at-bats against the Oakland A’s.24 All three hits came off of future Hall of Famers--one off of Catfish Hunter and two off of relief ace Rollie Fingers. But the 1974 season found Boswell back in a utility role, splitting time between second base, third base, and the outfield, while serving mostly as a pinch-hitter (9-for-42). His two-run home run on August 5, off the Expos’ Dennis Blair was the last pinch-hit homer of his major-league career. The 28-year-old Boswell was sent to his home state of Texas shortly after the 1974 season ended. He was traded to the Astros for 26-year-old outfielder Bob Gallagher in a swap of disappointing performers. Gallagher had hit .172 in limited at-bats with Houston and had been strictly a defensive replacement. There was some suspicion that general manager Joe McDonald had made the trade in part due to Boswell’s refusal to make a postseason trip to Japan. Two other players that had taken a similar stance--Duffy Dyer and Ray Sadecki--were also traded over the winter. At the time of the trade, Boswell had played the most games at second base in Mets history (506). Boswell competed with Larry Milbourne, Rob Andrews, and Tommy Helms for time at second base in spring training. Andrews secured the starting position, and Boswell resumed his status as his club’s number one left-handed pinch-hitter, with occasional starts at second and third. Despite being only 30, Boswell was considered at a disadvantage due to his age and his “extreme value” as a pinch hitter and late-inning defensive replacement at several positions. Milbourne and Cabell won starting roles, with Boswell entrenched as the team’s top bat off the bench.28 It wound up being Boswell’s finest season as a pinch hitter. He set an Astros record (since tied by Orlando Palmeiro in 2006) for pinch-hits in a season with 20. He went 20-for-65 (308) off the bench as the team improved by 16 wins. He closed his major-league career with the Astros in 1977, again taking the role as the team’s primary left-handed pinch hitter (14-for-53, .264), with occasional starts in the infield. Boswell’s final hit was a single off the Dodgers’ Dennis Lewallyn at Dodger Stadium on September 30. His final at-bat, against the Dodgers’ Charlie Hough, was a fly out to left field that ended the game on October 1. It came 11 seasons after he’d played his first major league game against the Dodgers. Boswell played out his option, and was not selected in the offseason free agent draft. He remained in Texas with his wife, Toney, in the Austin area. He currently works in antique auto sales in the Austin area and has a large enough spread to call himself a rancher. In addition to the sources cited in the Notes, the author also relied upon retrosheet.org and consulted Bock, Duncan, and Jordan, John, The Complete Year-by-Year N.Y. Mets Fan’s Almanac (New York: Crown, 1992. 1 Stanley Cohen, A Magic Summer: The 1969 Mets (New York: Harcourt, Brace Jovanovich, 1988), 130-131. 3 The Sporting News, March 11, 1967. 6 The Sporting News, December 9, 1967. 7 New York Times, February 16, 1969. 8 New York Times, July 15, 1969. 9 The Sporting News, August 9, 1969. 11 The Sporting News, August 30, 1969. 13 George Vecsey, Joy in Mudville: Being a Complete Account of the Unparalleled History of the New York Mets from Their Most Perturbed Beginnings to Their Amazing Rise to Glory and Renown (New York: McCall, 1970), 227. 14 New York Times, October 8, 1969. 15 New York Times, October 9, 1969. 16 New York Times, September 26, 1969. 17 Sports Illustrated, October 27, 1969. 18 The Sporting News, November 22, 1969. 19 The Sporting News, May 23, 1970. 20 The Sporting News, September 19, 1970. 21 The Sporting News, February 25, 1972. 22 The Sporting News, March 25, 1972. 23 The Sporting News, November 18, 1972. 24 Record had been set previously by Bobby Brown (1947 Yankees), Dusty Rhodes (1954 Giants), Carl Warwick (1964 Cardinals), and Gonzalo Marquez (1972 A’s). 25 The Sporting News, December 29, 1973. 26 The Sporting News, November 23, 1974. 27 The Sporting News, January 3, 1976. 28 The Sporting News, March 6, 1976.